There may be ongoing calls to attend public meetings on the Delta Tunnels, make calls to Senators on related legislation to protect the Bay-Delta, and much more ongoing and timely action alerts. Click here to go to our action alerts posted on our blog. Consider signing up for e-mail alerts or following us on social media. This is the best way to stay updated with the latest and breaking news on the Delta. Sign up here for instant or weekly e-mails. Engage in news and other content about water in California, especially on the Delta and the Delta Tunnels project. Respond to and redistribute news articles about the Delta Tunnels and related Delta water issues by sharing them with your social media network and writing concise comments focused on facts and not just opinion. Write letters to the editors, asking why they aren’t covering the Tunnels in greater detail or in response to a recent editorial or opinion piece (200 word max). Bring up points about drought; costs and taxes to pay for tunnels; family farms of Delta vs. unsustainable Ag, etc. Attend and/or organize others to show up at your water board and district meetings. Demand transparency and a public voice on decisions about the Delta and California water. 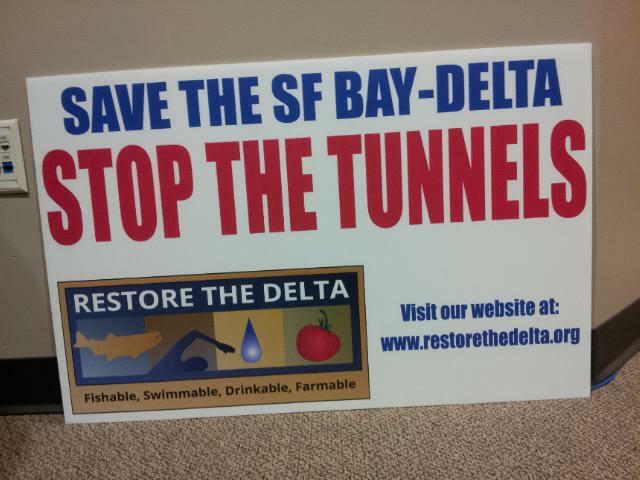 Organize as a protector of the Delta, taxpayer and ratepayer. Use our materials and follow our alerts to organize. Some of the most important water board meetings to attend involve meetings at the Delta Stewardship Council, the State Water Resources Control Board (SWRCB), Santa Clara Valley Water District, Metropolitan Water District, Westlands Water District, Kern County Water Agency, and of course your local water district/board! Want to volunteer? Host a fundraiser? Propose a speaking opportunity? Contact us. • Want to purchase campaign materials to raise awareness or distribute outreach materials? Scroll down! NOTE: If you have problem with PayPal buttons, it may be an issue with your browser. PayPal works best on Google Chrome and Mozilla Firefox. Description: A water proof foam board, size about 2 ft length by 3 ft width. Will come with two metal stakes and two complimentary “Save the SF Bay-Delta, Stop the Tunnels” bumper stickers. Shipped via USPS with tracking. If you do not receive your order within 12 business days, please contact [email protected], or call 209-475-9550. You may also drop by our office at 42 N. Sutter St., Suite 506, Stockton, CA 95202, Monday-Friday from 10:00 am to 4:30 pm, please call before dropping by. Thank you! Description: 11″ length x 2.5″ width, suitable for outdoor and indoor uses. To receive a bumper sticker, make a donation of any amount. Make sure to put under “Add Special Instructions to Seller” the number of bumper stickers you want (if you would like more than 1 bumper sticker). To order more than 20 bumper stickers, please consider ordering a pack of bumper stickers, see the distribute section below. Free materials to distribute! Please e-mail [email protected] for any request to distribute handouts for now. Handouts: These are easy to print 8″ x 11″ handouts that summarizes all the necessary information to increase awareness and opposition against Governor Brown’s tunnels plan. Go to our FAQs & Research section to print handouts.